South Carolina hosts a class of mushrooms called Basidiomycetes. This class usually possesses tissues called gills beneath a mushroom cap. Spores, the reproductive unit of the fungus, develop on little rod-like structures. South Carolina also plays host to a class of mushrooms called Ascomycetes. In this class the spores develop in little sac-like structures. Polyporaceae is a family of basidiomycete fungi. Most species of mushrooms in this family differ from other mushrooms in appearance. Instead of a cap supported by a little stem, they look like little shelves growing on the side of logs or trees. These shelves have little pores on their bottom surface. One of these shelf fungi, called Laetiporus sulphureus, grows in South Carolina in the Francis Beidler Forest and elsewhere, according to Audubon South Carolina. This edible mushroom bears the colorful popular name “Chicken of the Woods.” It is called a “sulfur shelf” because of its color. The mushroom family Sparassidaceae also belongs to the class Basidiomycetes. Sparassis spathulata, a species of this family, grows in South Carolina, according to Audubon South Carolina. Sparassis spathulata and similar species look like convoluted vegetable leaves. They consequently are called cauliflower mushrooms, according to Mushroom Expert website. Morchella, the edible morel, belongs to the mushroom family Morchellaceae and the class Ascomycetes. It grows in South Carolina, according to the South Carolina Upstate Mycological Society. But the poisonous Gyromitra brunnea, one of the false morels that resemble Morchella, also occurs in South Carolina, according to Mushroom Expert. Gyromitra also belongs to the class Ascomycetes, but it is a member of a different family called Discinaceae. Puffballs and stinkhorns are basidiomycete mushrooms with unusual shapes. The nearly spherical puffballs belong to the family Lycoperdaceae. The stinkhorns look like small stalagmites. They belong to the family Phallaceae. Both live in South Carolina, according to Hilton Pond and Mushroom Expert. 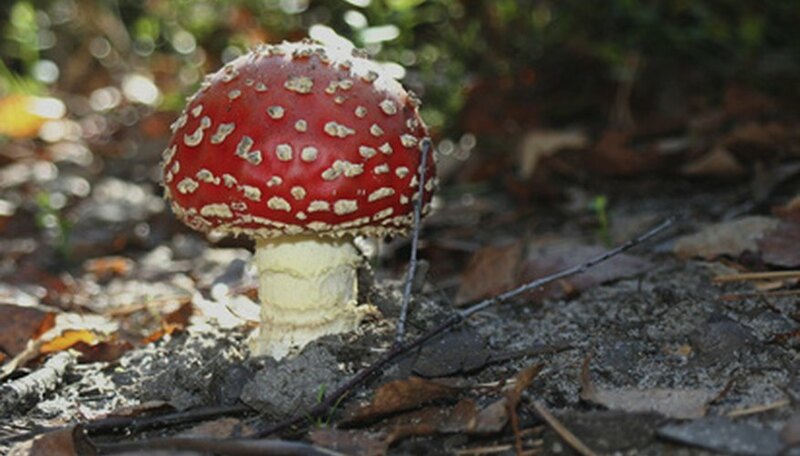 Poisonous mushrooms of the family Amanitaceae grow in South Carolina, including the deadly Amanita virosa and Amanita citrina, according to Mushroom Mountain. Amanita virosa bears the descriptive popular name “destroying angel.” Amanita is a typical basidiomycete mushroom with a regular cap and stem. The family Russulaceae contains several species of edible mushrooms that grow in South Carolina, according to Audobon South Carolina. Two species, Russula aeruginea and Russula virescens, have a green cap, but are eminently edible, as is Lactarius volemus, according to United States Department of Agriculture. Urnula craterium belongs to the family Sarcosomataceae. It is commonly called the “Devil’s urn” because of its dark cup-like shape. In spite of its sinister appearance, this South Carolina mushroom is edible, according to Mountain Mushroom. Coprinus lagopus, the inky cap, belongs to the family Psathyrellaceae. It occurs in South Carolina, according to Mountain Mushroom. Coprinus is a genus of mushrooms that grow on dung, and Coprinus lagopus is capable of growing on this medium. Zimmermann, Daniel. "Types of Mushrooms in South Carolina." Sciencing, https://sciencing.com/types-mushrooms-south-carolina-6661146.html. 25 April 2017.